MANILA, Philippines – Actress and host Maine Mendoza defended herself against accusations that she was being insensitive towards a ‘Sugod Bahay’ winner of noontime show Eat Bulaga. On the June 18 episode of ‘Juan For All, All For Juan’, segment winner Leny Feliciano shared that her child recently died. She said how thankful she is to be chosen by the show, “Opo. Sobra pong tuwa dahil mapapalibing ko na ang anak ko. Makakabayad pa po sa funeraria." At one point, host Joey de Leon who was at the studio asked Maine to repeat what the emotional mother said. Maine imitated the incoherent crying of the emotional winner. Maine further asked what happened and after Leny answered, Maine again, mimicked Leny’s tone and voice. 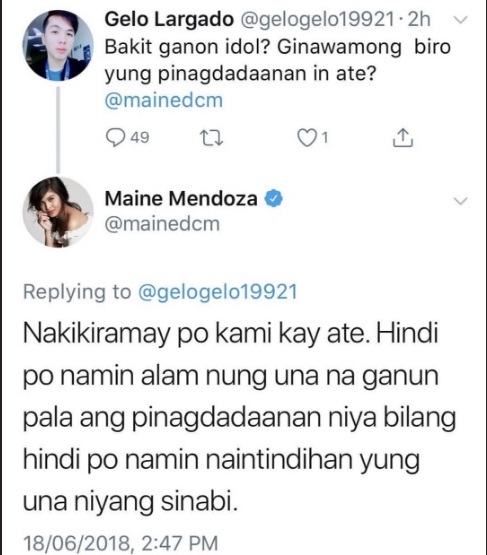 The netizen later on deleted her tweet after Maine’s reply generated attention and started a debate among her followers.